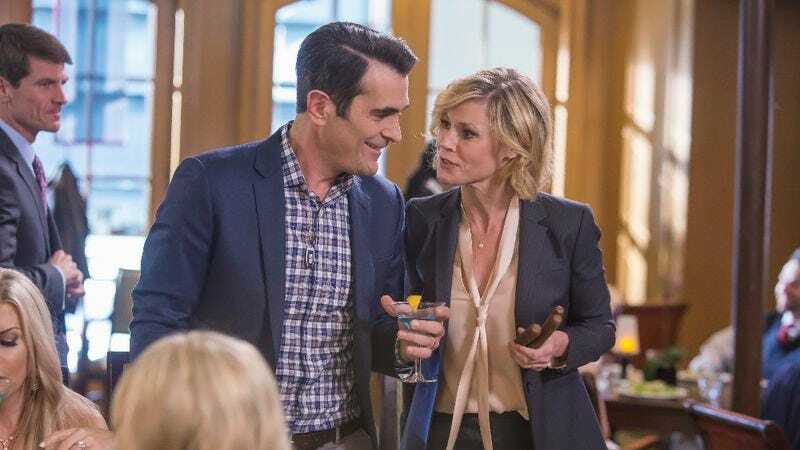 A large part of why this season of Modern Family has struggled, both in terms of comedy and drama, is that the writers seems to be running out of ways to test the characters, to put them in situations that allow for fresh, exciting storylines. Last week’s episode did a lot to earn some goodwill in terms of storytelling by focusing on how things are changing for many of the characters. Sitcoms often struggle to retain a unique voice as they age, but one way to stir up new conflicts is by putting characters into new situations. It looked like Modern Family was starting to do that these last few weeks, but tonight’s episode fails to keep that momentum going. In order to understand why “Thunk In The Trunk” kills the momentum, it’s important to first outline the storylines that make up this week’s episode. Time is shared between three separate plots. First, it’s Claire’s first day taking over for her father, and she spends most of the day following in his footsteps by taking meetings, buying scotch and cigars for clients, and even treating Phil like nothing more than a housewife. The second plot sees Cam and Mitchell worry about their most recent upstairs tenants, a creepy adult trio that don’t want anyone in their space and come to the house with a large trunk in tow. The final plot involves Gloria’s homemade sauce finally being stocked in the local grocery store, which is all well and good until Jay gets a look at the (not even scandalous!) cardboard cutout of Gloria that stands next to the display, blowing kisses with a mechanical arm. Within these plots and subplots there’s plenty of solid material. When Jay gets jealous of men ogling and taking selfies with the cutout of his wife, he wrangles an unwitting Manny into a pseudo-heist job, with Jay stealing the cutout and then using Manny to help get rid of the “body.” The best bits here work because they fully embrace the tropes of gangster films. Jay trying to get rid of the cutout, only to have it float to the top of a pond, is a great visual cut, and the same can be said of Manny reluctantly smashing the cutout into the trunk while Jay turns up the music in the car so that Gloria doesn’t hear. The same analysis applied to the Phil/Claire story and Cam/Mitchell’s, as in there’s some stuff that works amongst all the familiar material. For instance, Ty Burrell works wonders with a hoverboard—and emasculated, ignored man is exactly the type of guy he excels at playing—and Eric Stonestreet always delivers when he has to be in full-on paranoia mode. The problem, then, comes from the fact that Modern Family just keeps hitting the same beats over and over again. Like a cheap knockoff, no-name pasta sauce, almost every single storyline in “Thunk In The Trunk” is just a variation of another storyline from this season, with just a few of the ingredients changed to make it seem like something new. Sure, there’s something to be said for Modern Family‘s willingness to embrace continuity. The show could easily just throw the pasta sauce and room-renting subplots to the curb and pretend they were a single-episode gag. Instead, the show is choosing to expand upon those stories, to make them part of a potentially season-long character arc. That’s all fine and well, but only really works if the storytelling can remain inventive and engaging, not to mention, you know, funny. That was not enough June Squibb. Why do sitcoms keep wasting June Squibb! Phil was killing it with that hoverboard housekeeping. This episode does feature one of the best uses of Lily yet. Great visual gag tonight when Phil tells Claire that she’s “not a little girl anymore” and then she sits in her father’s chair and sinks right down. Also, Claire manspreading while talking about how she’s now a “powerful white male” was pretty great.